Mark Dresser has been actively performing and recording solo since 1983. 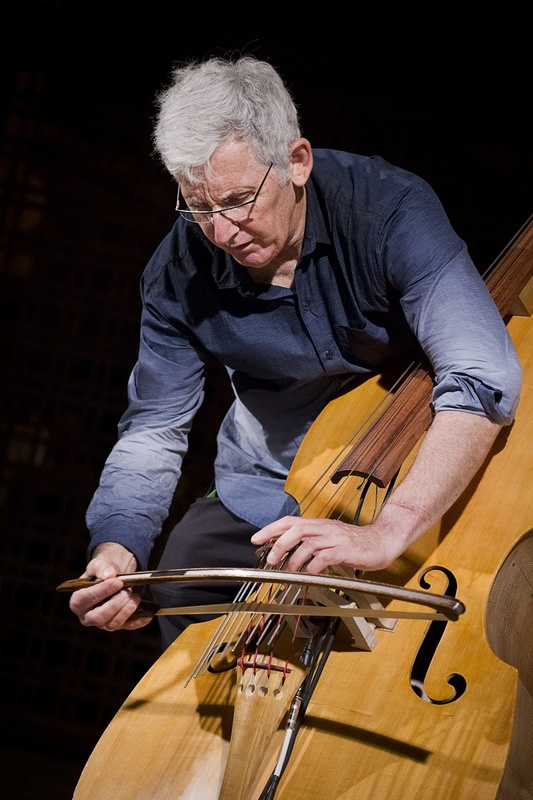 At the core of his music is an artistic obsession and commitment to expanding the sonic and musical possibilities of the double bass through the use of unconventional amplification and extended techniques. His solo works include the DVD/CD/booklet triptich Guts: Bass Explorations, Investigations, and Explanations (2010) and CDs UNVEIL (2006) and Invocation (1994) feature the music evolving out of this research. A chapter on his extended techniques, “A Personal Pedogogy,” appears in the book, ARCANA (Granary Press). Dresser has written two articles on extended techniques for The Strad magazine: “Double Bass Harmonics” (October 2008) and an “Introduction to Multiphonics” (October 2009). Dresser presented a lecture/demonstration titled “Discover, Develop, Integrate: Techniques Revealed” at the 2009 International Society of Bassists convention, where he curated a New Music Summit featuring lectures, performances, and panel discussions on improvisation and contemporary music performance. Dresser’s lecture is available as a download on Mike’s Masterclass, http://www.mikesmasterclasses.com He is available for solo concerts and masterclasses. “Mark Dresser has created a fantastic language for the double bass, one that rivals any created with machines in its ability to fascinate. Why call it fantastic, and not simply abstract? When it is not functioning with narrative or representational contexts (scores for “The Cabinet of Dr. Caligari” and “Un Chien Andalou” compositions whose subject span Bosnia, and the Marx Brothers), Dresser uses his language to pull the listener into, for the lack of a mushless term, another world, whereas, the abstract remains at arms length.